This is going to be a long post because of the technical aspects of the recipe so let’s go. I am posting today Kurma, of course you all know that I’m not a sweet tooth, so my sister made this one. She just loves Kurma.Kurma is a delicacy made by East Indians during Divali but it has gotten so popular that it sold as a snack year round. Strange that I did a search for kurma and found so many things not related to this delicacy, every Trinidadian has come to love, I saw that Kurma is an avatar of Lord Vishnu or even vegetarian Chef, Kurma Dasa. 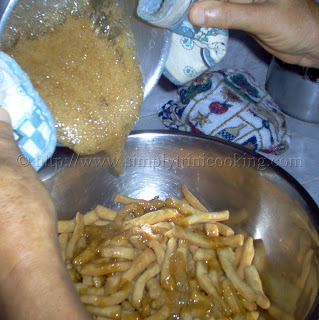 Anyhow, Trini Kurma is simple to make but the technicality lies with the sugar, it has to have the right consistency or else the kurma would not come out properly. 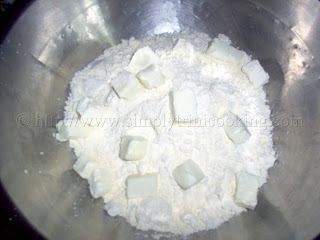 If it is poured before time, the kurma will come out sticky and the sugar will take long to dry. So follow the steps and don’t give up if you fail the first time. Since the steps are long I will stop now and go straight to the recipe. 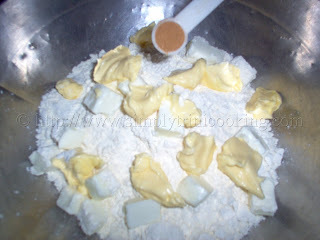 Sift the flour , add the cinnamon powder and ginger powder, and cut in the butter. 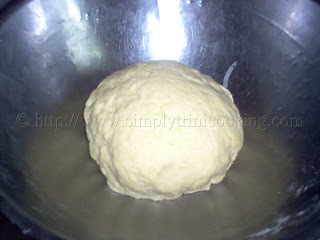 Add the water gradually and mix to form a firm, but hard enough dough. 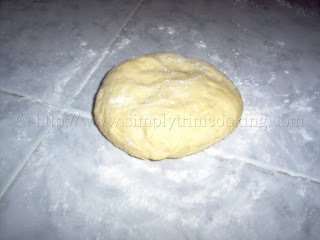 Dust the surface with a little flour and roll out each. 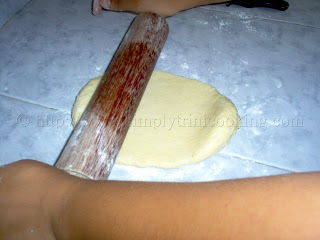 Roll until the dough is about 1/4″ thick. 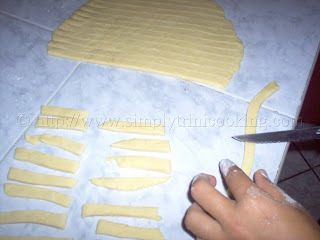 Cut the rolled dough into strips (about 3″ long strips). 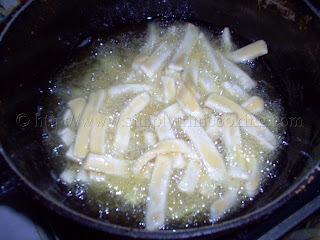 Drop the first batch of strips in hot oil. 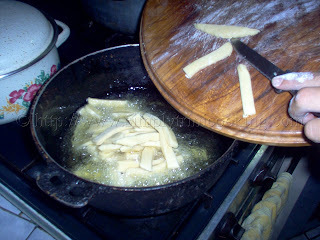 Stir to ensure strips are covered with oil. Fry first on a low flame until crispy. Then raise the fire. 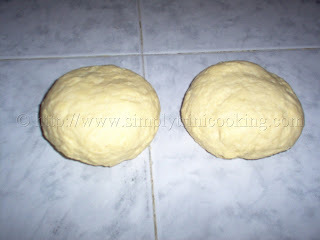 …And place on napkins or brown paper to allow the paper to soak up most of the oil. 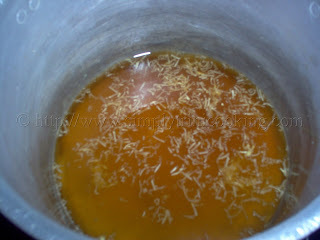 Drop the grated ginger in 1/2 cup of boiled water. Add the sugar (about 1 cup of sugar). 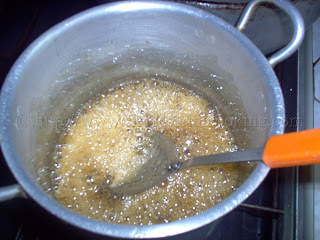 Stir ocassionally until a thick syrup is made. 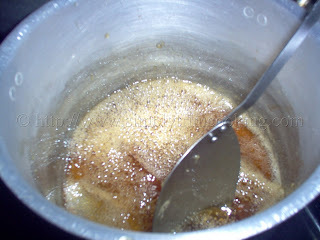 The syrup is ready when it drips and form long threads from a spoon. 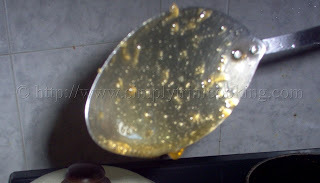 Pour syrup over kurma and mix quickly to glaze the kurma. Set aside the kurma to cool before serving. That’s it for another sweet post. Bye! I am so glad you posted this,i really like kurma and can’t get it too often here in VA so i’m happy to finally get a tried and true recipe!! ah, finally I can send people to a thin kurma recipe 🙂 My mother makes a good fat/soft kurma (in addition to the gulab jamoon) but I haven’t written down that recipe yet. 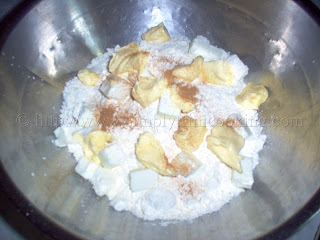 I really enjoyed posting this recipe because soon it will be Eid and Divali. I do hope I can do some more sweet meats by then. 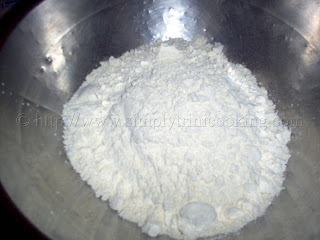 The reason the kurma is soft is because of the fire being too hot so the outside surface cooks faster than the inside. We had that problem before truly mastering it. 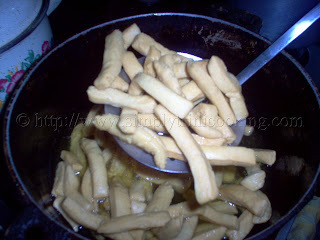 Next time try lowering the fire a little and allow the kurma to fry a bit. 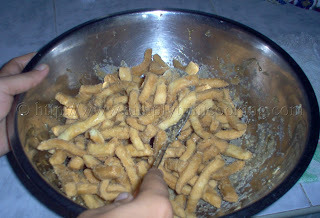 no, I didn’t mean I had a problem with the thin crispy kurma, I meant the other type of kurma that is made fat and soft/fluffy inside, intentionally. 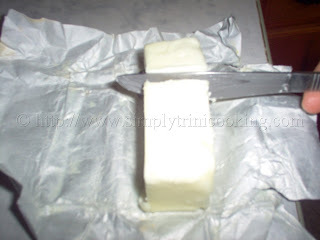 It is usually cut into big cuboid/diamond like pieces and served at weddings and other functions in the bags with barfi etc. 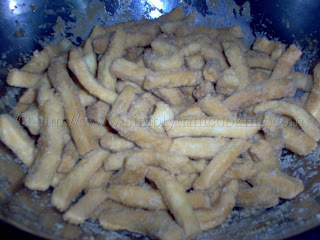 thanks so much for the recipe for kurma.,..looking forward to the others..
Great post. Having the photos really help.The instructions from the books are sometimes not enough. I will ‘try meh han’ at it now and ah go leh yuh kno! Will certainly check out the rest of your website.Thanks again. 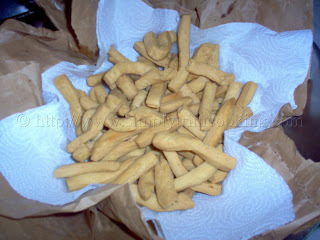 ah, my grandad used to bring these back to the UK for me every time he went back to Trinidad. So glad to have a recipe! Thanks so much, I have been looking for a good kurma recipe for years I finally got it. I was about 15 when me & my younger brother tried to make this by memory & boy was it a disaster. They were popping out the pot like stick-formed bullets; we had to shield ourselves with card-board just to turn the stove off. After picking them up off the floor to “glaze” them, they got stuck to the pot and I’m guessing it’s because we forgot 1 of the main glaze ingredient: water. I have tried many of your recipes with great results. I love this site. Keep up the good job. It’s hard work but it’s worth it. Thank you for everything. Thank you for acknowledging the hard work I’ve put in over the years. I feel honoured. 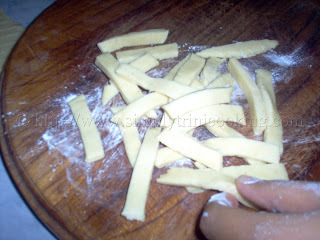 the recipes are easy to follow ,but only problem is you dont mention how much a recipe makes ,other than that good job. Awesome site! I am loving it!! Will come back again. I am also taking your feeds just to keep up to date. The recipe says 1/2 cup of sugar in the ingredients but 1 cup in the method for the syrup please clarify thanks in advance! Keep up the good work, much appreciated! Does the glaze have to be made twice for both batches? 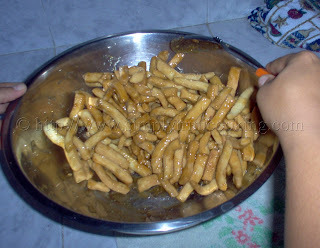 No just place the kurma in a large bowl and then pour the “glaze” over it and mix very quickly. 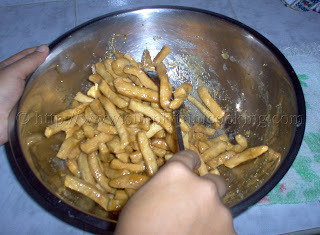 Whats the larger one called thats like kurma but fatter and sweeter? It has condensed milk and evapoated milk in it. 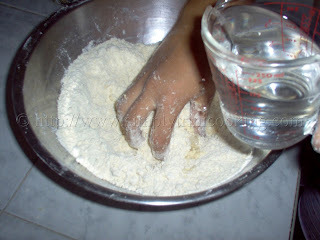 Hi Felix, Can you use milk instead of water to mix dough?? I don’t see much of a problem there. 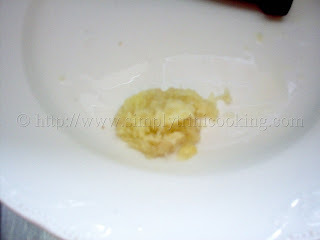 I tried this recipe and it’s came out horrible I felt it’s to much fat for the amount of flour it tasted and the texture was more like a cookie. 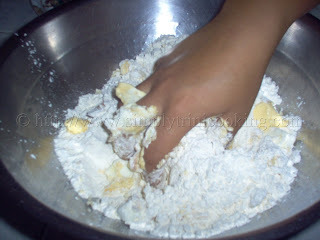 I’m sorry to hear that, but you probably mix the dough like you would for a cookie. I stand by my recipe. 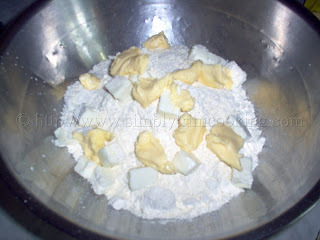 You cut the butter into the flour and mix the ingredients as you would a pastry. If you over mix you would definitely get a cookie dough.